The 1960 Sunbeam family was made up of the ritzy Rapier and the snazzy Alpine models. It was in 1948 that Sunbeams from Britain’s shore began to arrive on Canada’s fair domain. 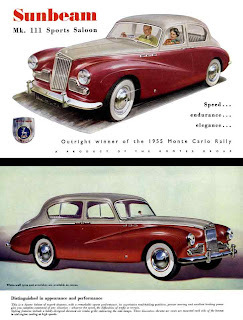 A cornerstone marque of the long successful Rootes Group, the Sunbeam-Talbot concern, located in Ryton-on-Dunsmore, not far from Coventry, kindly shipped us modest numbers of the Sports Saloon and the Sports Convertible Coupe. They were a pretty pair but the hefty $3,445 and $3,800 (respectively) price tags attached prevented Sunbeams from spreading throughout the Dominion like a wild summer brush fire. Folks bought in moderation. 1948 Sunbeam Talbot Sports Saloon was pricey. The next season, the Model 90 replaced the Model 80. Sales continued to be modest, but those Sunbeams looked sharp on showroom floors as they gleamed next to their more economical Hillman kin. Engineers and stylists cleverly turned the sedate Model 90 into an exciting two-seater Alpine. 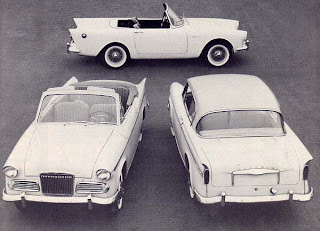 The sports car was added to the Sunbeam lineup in 1953-54. 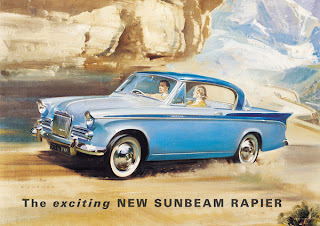 With a $3,177 price tag, it the most expensive Sunbeam one could buy. A 1955 Sunbeam Mark III Sports Saloon won the Monte Carlo Rallye. The Sunbeam Mark III Sports Saloon and Convertible were introduced in 1955 and the Alpine joined the fresh-faced pair; though the sports car was in its final year. The next season, the Mark III Sports Convertible was dropped in favour of the stylish Rapier two-door hardtop. 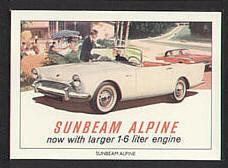 The latest Sunbeam offering was introduced with a list price of $2,575. Though the hardtopped Rapier was the sole Sunbeam offered in 1957 much was made of the fact that the marque was 700 dealers strong throughout North America. A convertible joined the two-door hardtop for the 1958 season. The ragtop was billed as having “sports-car comfort combined with family-style comfort.” The pair of Sunbeams continued to dazzle folks in 1959 with their tasteful, updated looks. Sunbeams weren’t just pretty faces, they continued to rack up impressive victories in European rallies. Advertising focused on those wins the spotlight shone brightly on the rugged and reliable 1.5-litre Rallymaster engine. Luckily for consumers here at home, prices stood pat at $2,545 and $2,680 f.o.b. Toronto, respectively. For 1960, a sleek and seductive two-passenger Alpine Sports Roadster joined the Rapier. The three automobiles were billed as the “great sports car trio.” This latest unibodied beauty was truly corporate sleight-of-hand magic, using the Hillman Husky station wagon’s floorpan as its starting point and borrowing its running gear from Rapier. Rolling on an 86-inch wheelbase, it could brag of being the only totally new sports car being offered for 1960. For a mere $2,595 one could have all the power and performance, comfort and convenience money could buy. The Alpine, like all Sunbeams, boasted front wheel disc brakes. It featured windows that rolled up in full-sized doors, which prevented milady’s hair from being windswept. Following the styling dictates of the day, a wraparound windshield was incorporated into the envelope as were tasteful fins. The four-cylinder, 1.5-litre engine had a cast aluminum cylinder head that permitted delivery of 83.5 horsepower to the close-ratio, four-speed manual transmission. Options for Alpine included a detachable aluminum hardtop, wire wheels, a padded centre armrest with a lockable compartment, an ammeter and a clock. Colour choices for Alpine were Carnival Red, Embassy Black, Glen Green, Moonstone and Thistle Grey. The Rapier Coupe de Sport was designed to satisfy the sports car cravings inherent in every family man. With a 96-inch wheelbase, it did seat four comfortably, after all. The 1.5-litre engine delivered 78 horsepower, more than sufficient to move the 2,360-pound vehicle at speeds guaranteed to attract the interest of Mounties, OPP and QPP on highway patrols. The Rapier’s tastefully finished walnut-veneer instrument panel carried genuine sports car gauges. The centre-floor mounted gearshift was exceptionally short—evoking a sports car driving feel. “If you want an economy-minded sports car that the whole family can enjoy,” then the hardtop Sunbeam Rapier Coupe de Sport was clearly the choice at $2,565. The four-passenger Rapier Convertible shared all the desirable attributes of the hardtop including the prize-winning Rallymaster engine. The fabric top adjusted to open, closed and the unique half-open Coupe de Ville position as well. This Sunbeam’s price tag was a cool $2,695. Sunbeam did well in 1960, racking up 1,212 units arriving at ports in Montreal, Toronto and Vancouver for delivery throughout the country during the calendar. The entire Rootes Group did equally well. Sales of 3,296 Hillmans; deliveries of Singers and Humbers added to the bottom line, making the folks at Rootes Motors (Canada) Limited beam from ear to ear, indeed. 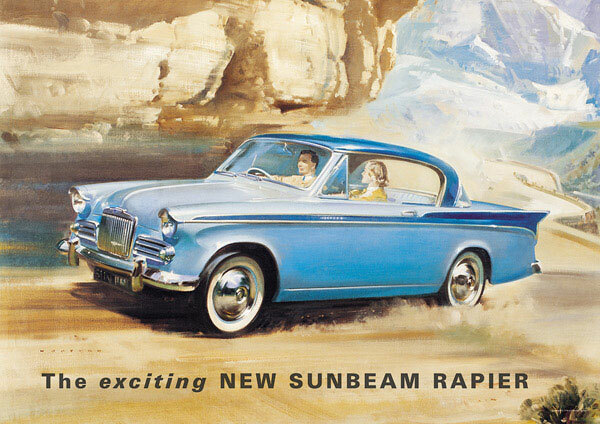 With the catchy slogan, “Rootes—it’s a better buy because it’s better built,” the world looked bright for next year’s Sunbeam sales. Unfortunately, the corporate smile would not last long; unhappy workers would lay down their tools and walk off the job in 1961.